Short drive to see waterfalls, visit whales and pet leopards! Villa Maggona is a tropical beachfront home neighbouring the glowing Indian Ocean. With 4 en-suite rooms, tall wooden beams, floor-to-ceiling glass windows, and plentiful palm trees, the accommodation boasts a contemporarily serene aesthetic. It hosts a fully-equipped kitchen, a private swimming pool and generous living spaces with warm wooden architecture. 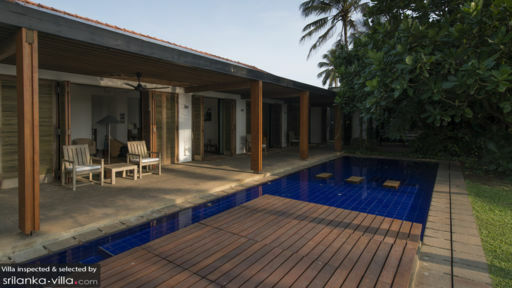 Within the perimeters of Sri Lanka’s Golden Triangle, Villa Maggona is a stunning open-planned setting that melts together a feel of privacy and openness. 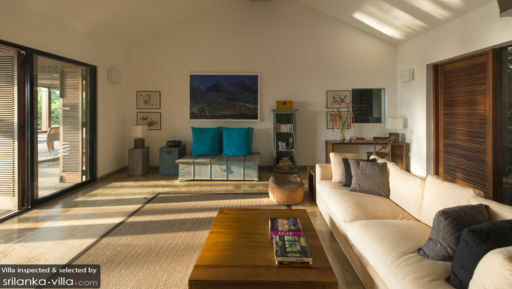 Villa Maggona offers 4 bedrooms within the space - the minimalist aesthetic of the suites feature matching teal accents and woven furnishings. The spacious and sleek architecture is enclosed with wooden panels that completely open to the poolside area. Each room features a full-length curtain to block out daylight when desired. A ceiling fan as well as a air-condition facility offers cool breeze throughout the space. The warm oak ambiance is complemented with cool-toned decor splashed around the space. The villa features a sprawling private pool and a wooden deck. The private pool resonates oceanic deep blue waters surrounded with tall palm trees and grass greenery. The pools are respectfully accompanied by multiple sun loungers lying under the solid shelter of wooden beams. Imagine sitting out during the day and sipping on fresh coconut water while nourishing the golden sunshines of Sri Lanka! Take a quick and easy plunge by the pool and feel the easy breeze, sound of the flowing waters and birds chirping. Within the main pavilion of Villa Maggona, a wooden-floored area accommodates an eclectic collection of earth-toned furnishings. A plush couch, two beanbags, a study desk, a low-lying coffee table and an array of framed wall-art. The central living space boasts high-beamed ceiling and a darkly-stained wooden accent. The space is one warmly lit and neighbours panelled wooden doors. Outside the wooden panels of villa’s ensuites, guests can find an alfresco dining space hosting a group of 10. The poolside dining sees plush aqua-and-white cushions comforting the chairs. A warmly welcoming team of staff is ready to treat guests of Villa Maggona with thorough help. Villa attendants to run housekeeping errands, 24-hour butler, laundry, spa and massage services are available at hand. Guests will not need to worry about keeping the humble home at tip-top shape! A small extra charge is added if other services are requested and made available. 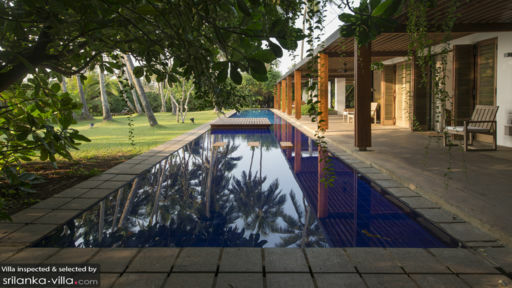 Nestled within the iconic Golden Triangle, guests need only to embark on a short drive to reach Bentota Beach and lagoon. The UNESCO heritage town of Galle hosts hints of colonial architecture and glistening beaches of Unawatuna and Thalpa, Wijaya and Midigama. The surrounding perimeters invite guests to visit secluded waterfalls, leopards at Yala National Park and whales at Mirissa. Perhaps if you’re searching for a romantic restaurant, do visit Bentota Lake or chase down some fresh seafood at Malli’s. A gentle reminder and recommendation to embrace the villa’s neighbouring mountains - and hike up the Rumassala Mountain. You’ll be blessed to witness the stunning sunsets of Galle and Mirissa Harbour.